Cordless glass kettle. Boil dry with overheat protection. Blue LED while boiling. Three-Pin UK AC power plug. When was the item sent & when can I expect my order to arrive?. Can I collect the item?. What should I do if I have an incorrect item or a fault with my item?. MPN: 21400. There is a removable, washable filter to keep your kettle and water clean and free from ‘bits’. It sits inside the easy pour spout and can be easily taken out, rinsed under the tap and replaced. 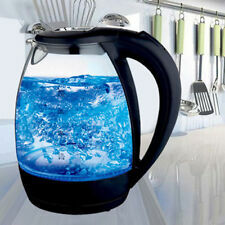 Let's watch water boil and nothing shows off boiling water better than a led light illuminated glass kettle! Enhance your kitchen style with this highly functional and fashionable, exclusive edition glass and stainless steal kettle. 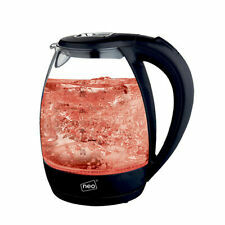 1x Cordless Illuminated Glass Electric Kettle 1.7L. Cordless glass kettle. Boil dry and overheat protection. Neo Direct. Red LED while boiling. © Neo Direct. For any kitchen. With three-Pin UK AC power plug. With the clear water window, it will also make topping up much easier than before. Boil dry protection - automatically switches off when the kettle is empty. USEFUL LINKS. 360 degree base. Pull off lid. – Temperature can be set electronically between 70°C and 100°C or quick start function without preset temperature (100°C). – Simple handling due to cable free technology and 360° rotatable plug connection. 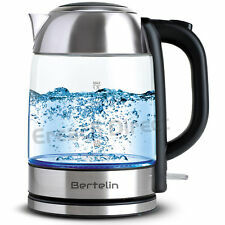 1x Cordless Illuminated Glass Electric Kettle 1.7L. Cordless glass kettle. Boil dry and overheat protection. Neo Direct. Blue LED while boiling. © Neo Direct. For any kitchen. With three-Pin UK AC power plug. TWK76075GB - Bosch. TWK76075GB cream / anthracite. 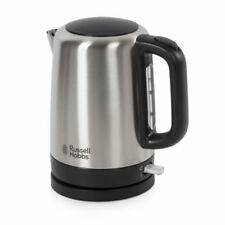 • Automatic switch-off: kettle automatically switches itself off when water has boiled. • Lift-switch-off: The water kettle automatically switches itself off when removed from it's base. 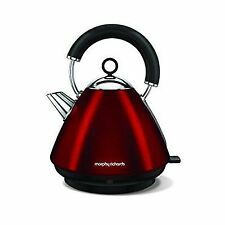 All relevant details have been included with the kettle 1.8 cordless Electric kettle.The professional designers from our supplier have designed the kettle to be as user friendly as possible. 1.8 KETTLE PINK. Water level indicator. 360-degree rotational base. “This item has been inspected, cleaned and repaired to full working order and is in good condition. The ZOKOP HD-1857-A 220V 2200W 1.8L Electric Glass Kettle is the perfect blend of elegance and functionality. A halo of blue LED lights beautifully illuminates the pot when it's in use, so it's not only practical, but very attractive to look at. It has a hinged lid for easy filling, a slide-out washable water filter and automatic cut off for safety. Boil dry protection. It features large water level indicator windows, cordless design and 1.7L capacity. Safety features, too, such as overheat and boil-dry protection plus its 360-degree swivel base make this kettle worthy of a place in any kitchen. Blue illuminating - Features an illuminated display that turns blue as water boils. 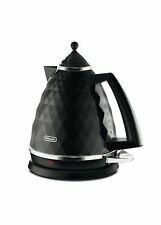 George Home Black Cordless Kettle Fast Boil 1.7L with LCD Temperature Control. This kettle has been de-scaled. kettle powers up and boils water . Small Dent/Scratches On Lid Or Body. The gradual blend of colour creates a copper ombre effect, an active trend that won’t go unnoticed in your kitchen. Rapid Boil Zones. 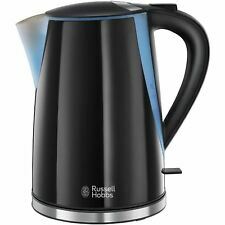 Gloss Black 1.7 Litre Cordless Jug Kettle and 2 Slice Toaster Set. This black kettle and toaster set is a great addition to any kitchen. 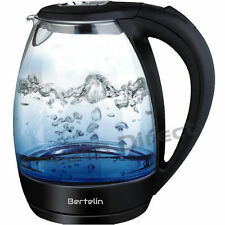 Kettle features: 1.7 Litre, washable filter, Dual water level indicator window, Max 2000W. Equipped with removable and washable scale filter, cold surfaces, an ergonomic handle with soft touch finishing and auto-off system, it's an essential ally in every kitchen. Cool to touch with Supportive Base. There is paint missing from inside the rim of these kettles, this doesn't affect how the kettle performs and it isn’t visible while the lid is closed. 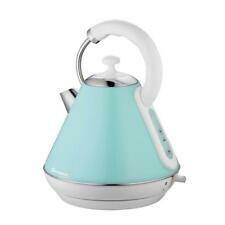 The 360 degree swivel base lets you fit this jug kettle into any kitchen kitchen setting. The ergonomic handle can be turned inward to prevent accidental knocks during boiling then swiveled back out to make lifting and pouring easy. Swiss Luxx. Stainless Steel Kettle and Tiny Toaster Set. 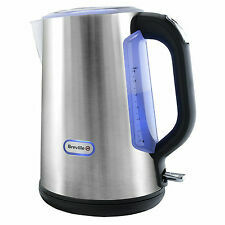 Kettle:220-240V, 650W with a1.0 Litre Capacity. Toaster: 700 watts 220-240V and able to hold 2 slices. There is a crumb tray at the bottom of the toaster. New Model -KLF03CRUK. May contain minor marks from transportation. Be inspired every morning with a delicious cuppa from the Inspire White Kettle. Combining premium, textured plastic and stainless steel accents, this classic white kettle adds a touch of class to any kitchen. ROYALTY LINE 1.8L STAINLESS STEEL SILVER KETTLE. Boil dry protection - automatically switches off when the kettle is empty. PREMIUM HIGH QUALITY ROYALTY LINE. 360 degree base. Push button operated lid. Kettle powers up and boils water . May contain small marks. 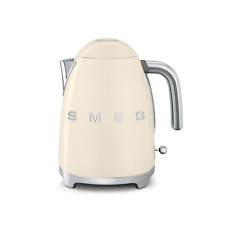 These kettles have a small dent/scratches as seen in the example images. Boasting a large 1.8L capacity and 360° swivel base, this kettle removes the difficulties of boiling water. Fast boil technology. Automatic switch off. We promote a 'repair not replace' culture instead of a 'throwaway society'. 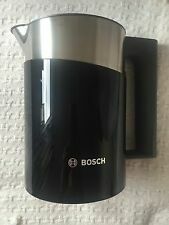 1.8L CORDLESS ELECTRIC KETTLE. GM Professional provide excellent after sales service. 1 X 1.8L Kettle with 360 swivel base. 360 SWIVEL BASE, CORDLESS JUG. These areas are shown below Electrical Products. This kettle has been de-scaled. 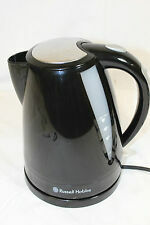 1.8L ELECTRIC CORDLESS KETTLE. Wide water level indicator with marks. New Arrivals. We do variety of quality kitchenware, cookware, household, electrical, bathware & DIY Tools at very reasonable prices. 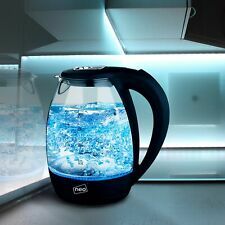 ThisBlack 1.7 Litre 2200W Fast Boil Dual Colour Illumination Electric Cordless Jug Kettle from Voche® has an eye-catching design with a dual colour illumination feature, it lights up blue when plugged in and turns red during the boiling process! Its moonlight grey appearance makes it even more appealing combined with its fast boil and easy pour design. You will never dread the tea and coffee run again, but instead you will watch in wonder as your kettle boils. 360 degree rotational base. Pull up lid. Stainless steel body. Neon light on/off switch. Power: 2000W. Colour Indicates when Hot -Blue - Off / Red - Boiling. Auto Off with Boil Dry Protection. A modern addition your kitchen. There is a removable, washable filter to keep your kettle and water clean and free from ?. It sits inside the easy pour spout and can be easily taken out, rinsed under the tap and replaced.